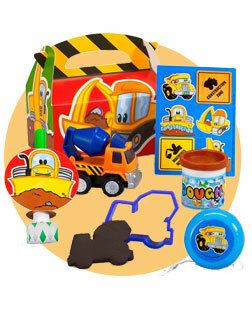 Construction Party Party Supplies are sure to please your son and all of his guests – it's no secret that boys love big construction vehicles! You can get tableware like cups and plates, favors like vests and tool pouches, and decorations like balloons, pinatas, and dangling swirls to make everything perfect! CAUTION: Creativity, adventure and fun times lie ahead! At Birthday Express, we work hard and we play hard. We know how wonderful a hard day’s work can be, but we’re here to make sure throwing your child a party doesn’t feel like one. So let’s roll up our sleeves and dig into some fun! Bright reds, oranges and yellows and lots of interactive entertainment form the winning recipe for your Construction Pals birthday party! From dump trucks to construction-cone candles, we’ve got all the right nuts and bolts to ensure a fun and memorable party for your child and all your guests. I know. We carry a lot of birthday supplies. And we love it all. But we want you to focus on the right accessories for your space and your child’s party to ensure a party that fits you in every single way. We’ve found so many cool ideas that come along with this theme and there’s so much room for personalization and DIY creativity. We’ve got all the accessories you might need. But the more tools you’ve got in your own creative tool belt, the better. Step aside, the party truck is backing up! 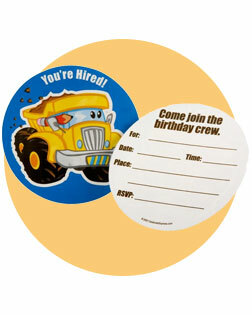 Invite your guests in true crew fashion with the Construction Pals invitations! Inform your guests of the party details and get them revved about the theme all in one colorful invitation. When it comes to choosing a theme and throwing a party, it’s good to have options. We want you to have just the right ingredients to put together a great shindig, so we pride ourselves in a large variety of quality decorations to help. We have items for large groups, small groups, young children or older kids. Our Construction Pals line of accessories features many highly customizable and house-designed pieces to make planning the party as much fun as having it! The Construction Pals Balloon Bouquet provides a colorful and festive way to let your guests know they’re at the right work site. It includes ten total balloons, two spools of curling ribbon and a balloon weight. The Construction Pals Personalized Birthday Banner is a great way to make your child feel extra special during the party. It comes in three sizes and is made of durable, heavy-duty vinyl, plus it features metal grommets for easy hanging. The table is an awesome place to let the theme shine. That’s why we’ve got all the trimming to turn your table into a bona-fide work zone! From napkins to plates, cups to utensils, our collection of Construction Pals tableware features various sizes and styles of tabletop necessities to fit your party. We even offer Construction Pals Personalized Dinner Plates, a 9” plate with space for a personal photo and custom message. What takes a party from great to fantastic are the activities you can plan for your child and guests. One of the best things about the Construction Pals party is the long list of interactive fun that goes along with it! As always, feel free to improvise and add as you wish to make it your own. But here we’ve outlined just a few of our favorite activities to get this party steam rolling. Put your hard hats on and make it rain with the Construction Pals Bulldozer Piñata Kit! The kit comes complete with one piñata, one bag of piñata filler (an assortment of toys and candy) one blindfold, and one kid-sized piñata buster. Looking for an easy way to keep the crew entertained? The Construction Pals Activity Placemats are the perfect solution! Whether it’s before or after the meal, these placemats allow the kids to color away so you can prep whatever is next. 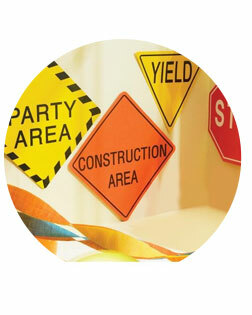 Make your party an event with Construction Pals Photo Booth Kit! Encourage your guests to come dressed in their best worker outfits and get ready to capture the fun! Customize your kit with decorations and dress-up accessories. Don’t want your event to be a costume party? No worries! We’ve got lots of dress-up accessories to make your photo booth a hit. In your kit, you can included hard hats, construction vests and even some sweet shades for all to enjoy! We love being able to share our ideas and our products with you, just as you love to share joy and fun with your children and their friends. As the little construction workers are busy coloring and building together at the party, no doubt they will be having a blast. With our collection of Construction Pals party favors, they’ll be skipping down the freshly cemented sidewalk with a great keepsake for remembering the good times shared. Even the hardest-working construction pals have a sweet tooth. 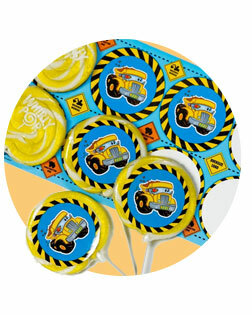 Everyone loves these personalized lollipops! Reward the workers after a long party with treats inside the favor box. Your workers only deserve the best! We feel very fortunate to be a helping hand on your child’s special day, and we love providing the products and services to make planning your celebration a breeze. As mentioned before, we also offer a great variety of customizable accessories to help make your party one of a kind. Whether it’s for an infant, toddler or even a young adult, we can help you personalize your event and make it even more special for you and your loved ones. The Construction Pals Personalized Favor Box is another great way to put an individual spin on your party favors. Customize the outside with text or a photo and fill the box with whatever you’d like! It’s like an old-fashioned lunch pail! A party isn’t just about the birthday boy or girl. It’s also about all the people who come together to celebrate and the good times that are shared. Our Construction Pals-themed thank you cards provide a fantastic way to thank your guests for their gifts and presence, and they bring a successful party to an official close. We encourage filling them out together! It can be a wonderful way to reminisce and look back together on what we hope was a perfect day.